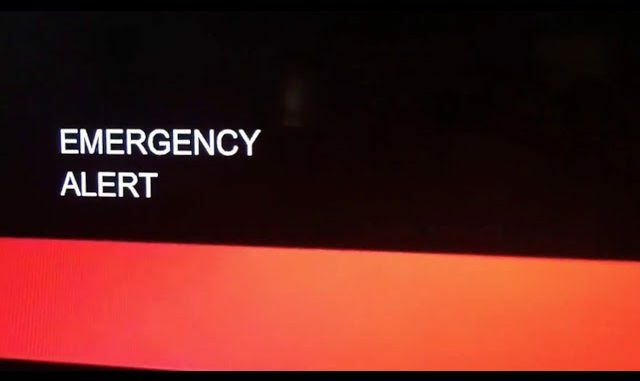 Emergency Broadcast Warns of Armageddon. Mysterious Emergency Broadcast Warns of Armageddon. Regularly scheduled broadcasts were interrupted Thursday morning with strange emergency messages warning of extraterrestrial invasions and the beginning of Armageddon. The bizarre warnings aired on TVs in the Orange County area, affecting Cox and Spectrum cable users, according to the Orange County Register. The audio comes from a call that Art Bell, the host of the conspiracy theory-themed radio show Coast to Coast AM, received in 1997 from a man claiming to be a former Area 51 employee. Other videos of the emergency broadcast feature a different voice warning that “extremely violent times will come.” Redditor smittenkitten77, discovered the audio came from the Christian radio program Insight for Living with Chuck Swindoll. Cox spokesperson Todd Smith said that the company does not know how many customers were affected and is still trying to determine where the originating signal came from. Cox believes its system got the message after a radio station or multiple stations were conducting their monthly emergency test, which cable networks piggyback on. Usually, radio stations transmit an end “tone” to complete their alerts. However, this time, it seems no such tone was transmitted. Many viewers reported being alarmed and confused by yesterday’s broadcast.